While many households have their own air conditioning system, a large number of people rely on portable air conditioners that need to be vented to the outside for some cool relief from the heat of summer. The problem many face is in how to vent their portable unit, which this article addresses. First of all, a quick recap on why AC needs to be vented to the outdoors in the first place. Why Do Air Conditioners Need to be Vented? The process that's working inside all AC devices is known as heat exchange. This is where warm air is taken from the room and has the heat removed from it before being cycled back into the room as chilled air. The heat that is removed must, of course go someplace! If it was allowed to cycle back into the room with the chilled air, there would actually be a net heating effect as the heat would cancel out the cold. For that reason, the hot air is vented outside the building to be carried away into the atmosphere, leaving only coolness inside the building. How Are Portable Air Conditioners Vented? There is one major difference between a fixed HVAC system and a portable AC. The fixed system includes extractor units on the outside of the building that vent the hot, moist exhaust air away. Portable units by their very nature are not fixed to external extractor fans so they must be vented separately. Most satisfy this necessity by including a wide, flexible plastic hose that connects to the back of the appliance and is fitted to a convenient external point such as a window or custom-installed room-vent. This is great if the room you need to cool has an accessible window that a fixing kit can be attached to and even better is there is already a room vent installed. But what if the window is too high up for the hose to reach or there is no wall-vent? Have a workman install a wall-vent that you can connect the hose to. This is probably the most effective solution as it enables the unit to be placed unobtrusively near the wall and connect to the vent easily while concealing the hose neatly in the back of the unit. Give your appliance some assistance in reaching a high window if that's the only outlet available and you don't have the budget for the previous idea. Lift the AC onto a sturdy table or chest to raise its height so the flexible hose will reach up to the window. Make sure it can't move or roll off the table by chocking the wheels with rubber wedges to avoid accidents and you'll have cool air in your room. If the room is internal to the building with no external window or other outlet, get a workman to install some ducting to take the hot exhaust air away either through the attic or under the floor. 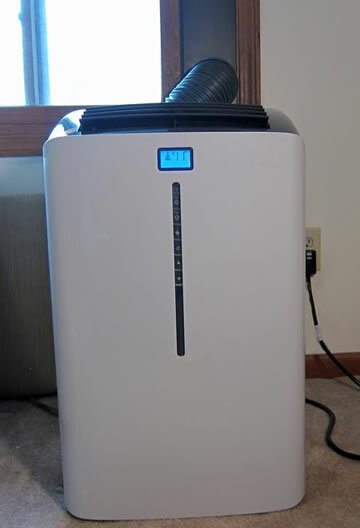 This can be an expensive option, but when all other avenues are closed, this may be the only way to get cool air in an otherwise hot internal room. There are other alternatives to AC for cooling a space in summer such as evaporative coolers. However these depend on the air being relatively dry to be effective so check your local weather station for the humidity levels in your area. That wraps up this article on venting an AC to the outdoors, where it's possible of course. I hope you gained some knowledge and maybe it has helped you to come up with some ideas of your own on how to go about this task and other HVAC related things.